Looking to start your ISM soon? TCR writer Samara Gan shares some tips on what to do before starting! Doing an ISM soon but not sure how to get started? We at The Cinnamon Roll have compiled a list of resources that can help you navigate your ISM journey. For the uninitiated, ISM stands for ‘Independent Study Module’. Like what its name suggests, taking an ISM means directing your own learning by coming up with your own list of readings, doing your own research, and basically learning all there is to know about a chosen topic, all on your own. Think of an ISM as a mini research project. ‘Does this mean I have to grade my own assignments?’ No, of course not! You will still have a supervisor to check in on you once in a while, and grade your submissions. Doing an ISM means you have the freedom to decide what kinds of assignments you want to set for your module, but this freedom comes with certain restrictions as well. For example, you will definitely have to submit an essay or report by the end of your ISM as part of your assignments. The first step of every ISM is coming up with an idea for a topic you want to research on. The important thing about doing an ISM is making sure that you are interested in the topic you research on. If you have spoken to some of your seniors, they might tell you about how much of their lives have been consumed by their ISMs. They spend so much time on their ISMs that it seems like they are dating their ISMs. Why would you want to spend so much time together with someone (or something) that is not interesting? That is why any sane senior would recommend that you pick a topic that you are interested in, or at least curious about. If you find it difficult to generate ideas for your ISM, check out the simple chart below for some ideas. I spent half of the prior semester reading up on the potential topics I could explore in relation to comic book studies (which was a topic that I am extremely interested in, but sadly not part of my major), and another two whole weeks of my December holidays working on my ISM proposal. And that is not counting the amount of time I spent meeting professors to discuss my ISM (because searching for a professor is almost like finding your soulmate; you almost never find the right person on your first try) and the time I spent actually searching for readings to add to my list. It is always recommended to start your research process early, preferably during the holidays, so that you can make sure you are as prepared as you can be for your ISM. To visualise the preparation process, take a look at the suggested ISM preparation timeline in the infographic below. Generally, USP students are required to do at least one ISM as part of their curriculum. However, there are exceptions to the rule, such as students in the double-degree programme, USP special programmes, and NOC programmes. FoE: Engineering students in AY2016/17 have the choice to read two out of ESP3901, ESP3902, and ESP3903 as USP ISMs substituting for Science & Technology (S&T) Inquiry Modules, but ESP3901 is not available for students matriculating in AY2017/18. SDE: Project & Facilities Management majors matriculating in AY2016/17 take PF2303 Materials Technology as an ISM, but those matriculating in AY2017/18 may choose between this module and PF2103 Measurement (Building Works). Requirements for students from other faculties have not changed between AY2016/17 and AY2017/18. You can read up on the ISM guides for students matriculating in AY2016/17 and AY2017/18 for specific information about the academic requirements for students from each faculty. The USC Academic Committee will be organising an ISM showcase on 22nd February at 7pm, Ngee Ann Kongsi Audi. Seniors will be sharing their ISM journeys and offering advice on how best to prepare for your ISM. For more information, the USP website offers more information about ISMs. You can also contact Anne (anneyeo@nus.edu.sg) or Rohayu (usprh@nus.edu.sg) from the USP administration office for further inquiries. 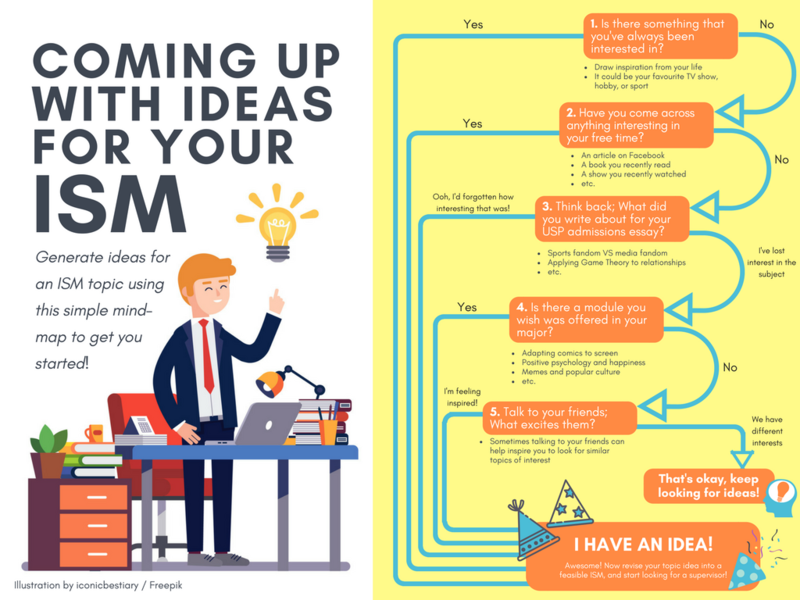 Download the ISM idea generation chart or the ISM starter pack infographic and start your brain juices flowing!